We got a Lexar Professional 800x in for data recovery. The Professional series are all based on Silicon Motion CF controllers with Intel/Micron NAND flash memory. 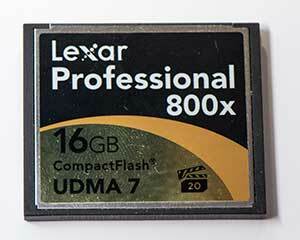 Depending on the generation Lexar has implemented some interesting modifications, for example, doubling the physical capacity of the device while only writing to half of it. e.g., 32gb of NAND memory on a 16gb card. My guess is to try reducing the amount of data in “shared” pages in MLC NAND, perhaps trying to create a SLC/MLC hybrid for endurance. The Professional series tend to be very recoverable. The Silicon Motion controller is committing large chunks of information quickly, so you see large block sizes with a simplistic design which make the chances of a successful recovery very high.